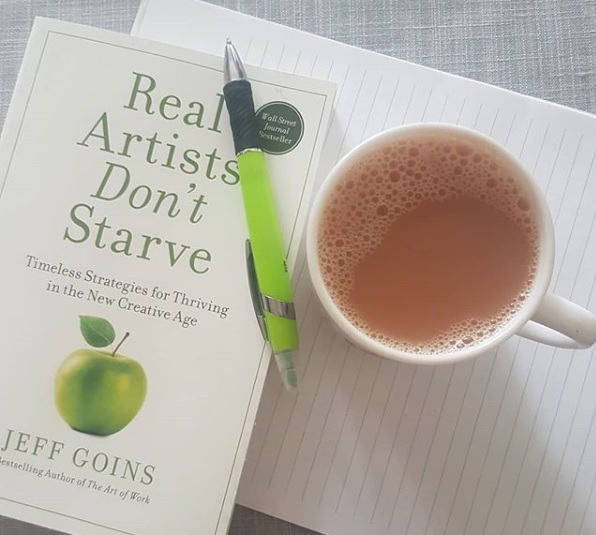 I just finished Real Artists Don't Starve by Jeff Goins in one sitting and have posted it as a giveaway on my Instagram account. Head on over to enter. I loved his well paced prose, practical advice, and motivating storytelling. Among the advice was debunking the myth of the overnight success. Most of the time, the big stars we see today put master level hours of practice into place before they saw breakthrough. That can happen in 10 years or it can happen in less depending on how frequently you are practicing your craft and releasing it into the world. This is good news. You have control over how much time you are devoting to building master level craft into yourself as an artist. Here are 5 ways to put the time into your overnight success. 1. Revamp your vision of success. What about if success looked like a series of professional accomplishments instead of one breakout project that either flops or propels you into overnight fame. Approaching your creative career one milestone at a time means you will grow in aptitude as well as reputation and will find the journey more enjoyable and less angst ridden. 2. Make a what if timeline. This is a basically making yourself a list of things to try your hand at. What if you sold something; worked on your craft for x amount of hours; showed your work to a gallery, agent, or online world; gave an interview; donated your time to a high profile cause; joined an association; promoted your peers' work; applied for opportunities; and kept going at until breakthrough. Not everyone will do this. You can be one of the ones you does and gets the breakthrough. A goal can be any of the above or an amount of words or pieces, hours spent at craft. Make it specific so you know when you've hit it. Then, make another one. Your community does not have to be made of just the creators in your market, niche, or craft. Any creative energy exchange will be inspiring and provide momentum. It is also likely that by gathering creatives around, you will come across opportunities and inspiration you can use and others you can share to grow your community and benefit others. 5. Vary your project size and type. Both for practical purposes in money and time, varying your project size and type means all of your eggs will not be stuck in the same proverbial basket. If you are a writer, you could write pieces of different length & of different genre for different markets with different purpose. They can have Some creative work could be to establish a quicker source of income. Other projects could be to promote your name and yet others could be to collaborate with the greater creative community. Let me know what you've tried. If you have any questions about your projects, feel free to email mvandepolwritingservices@gmail.com . I'd love to flesh out ideas with you. 1. Leave a current writing document open and ready. Whether it is a google doc or a document saved to a USB or laptop, if you have somewhere to direct your writing energy, you are already one step ahead. Set the timer and type out the 10 or 40 minutes you have available at any given time. 2. Think of yourself as a writer. By writing regularly, you are affirming who you are and what you do. By thinking of yourself as a writer and identifying that way, you increase the likelihood writing will be your default activity. Connect with other writers at coffee shops or at conferences and see the power of community work to your advantage. 3. Map out your projects on the calendar. When you give space to specific pieces of your writing projects on the calendar, you have both a plan and the time to execute it. Adding a 500 word short story, blog post, novel outline, article query letter, &/or another 2000 words to your manuscript to the calendar as to do's or deadlines means you will have something to check off and a new goal to set far before you are being held accountable by your readership or editor. 4. Welcome a variety of writing capabilities. Some days you will feel like an inspired literary genius. Other days you will feel ridiculous typing cliched and repetitive prose. Both types of writing sessions get your manuscript complete. Resist the urge to delete an unsatisfying writing session until you get to the editorial stage. Leave that first draft alone. Mastering this approach will identify any self-doubt and self-sabatoge and get you past them that much quicker. 5. Reward yourself for writing. Some days writing itself is the reward: a quiet time alone to dive into the story can be a treat. Other days it needs a reward to get done. A book to read, a second cup of coffee or tea, a walk with a friend can all follow a writing session. Hit the word count, get the prize. It is a cheap incentive program and it works. Remember to leave the emotional drama to your characters. It won't get you any farther to subject yourself to it. Any past neglected writing opportunities are just that. It is up to you to find the time in your upcoming schedule and you can do it. Post image found on my instagram account. 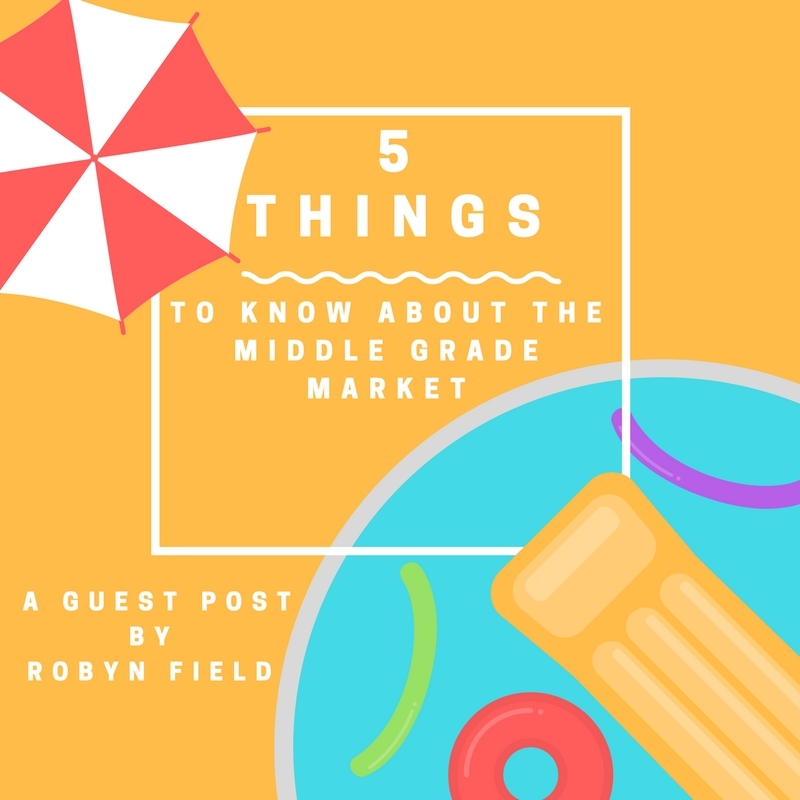 Being in the middle of wrestling with middle grade myself, I am thrilled to bring you this helpful guest post from award winning author Robyn Field. The middle grade market is my absolute favorite genre to write! There’s just something about those very first slow dances, the awkward moments between friends, the tension of growing and changing…I didn’t love these times when I was in the thick of them, but I sure do love writing about them now, and I love giving kids characters in which they can see themselves. The Age Range: Middle grade spans roughly ages 8-12, and is typically separated into lower (8-9) and upper (10-12) years. Any younger, and you’re getting into chapter books. Any older, and you’re getting into young adult. The Protagonist’s Age Rule: Kids this age always want to be one year older – that much closer to the much-dreamed-about teenage years! Therefore, make your protagonist one year older than your target audience. For example, if you’re target audience is age 12, make your protagonist 13. If your target audience is age 8 or 9, make your main character 10. Romance: To Be or Not to Be? To be! Upper middle grade readers love reading about middle school crushes, princesses getting married, or older siblings having boyfriends or girlfriends. But here’s the catch: the romance MUST be innocent, pure, and age-appropriate. Young adult is the genre in which you can dive into more deep or controversial aspects of relationships, but middle grade is the genre in which you simply celebrate the innocent joys of “tweendom” or commiserate the common awkward blushes and conversations between coming-of-age kids. The Tension of Growing Up: Middle grade readers are still kids, but they’re also dreaming of teen years and are headed into them quickly. No matter the plot, your middle grade protagonist should always be pulling and pushing internally with the tension that comes from growing up. For example, maybe your character is excited to go to the movies alone with her friends for the first time, but while she’s there, she secretly misses the popcorn she and her dad usually share at the movies. Kids this age want to grow up, but they also don’t want to leave security behind. This tension should always be present. What About Animals? You might be surprised to hear this, but in the middle grade genre, you can use animals as your characters! You must do it well, of course, and the plot certainly can’t be a picture-book type of story. Your animals must have human emotions and relationships – they MUST be relatable to your reader in the way human characters would be. Want More Info? The best resource I’ve come across in studying the middle grade genre is Mary Cole’s Writing Irresistible Kidlit. This book addresses word count questions, plot issues, character creation, and more – all for young adult and middle grade writers. You can find Robyn and follow her writing journey over on Instagram at https://www.instagram.com/robynfieldwriting/ or on her personal Christian living blog, www.fieldsofgraceblog.com . 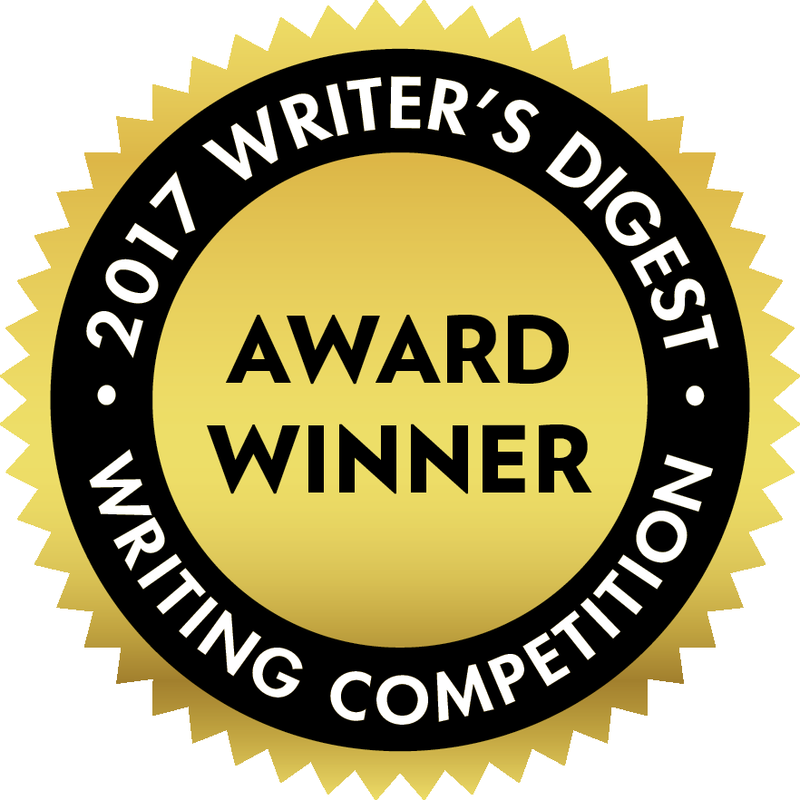 She is a 2017 Writer's Digest Writing Competition Award Winner. If you are both a writer and someone who likes listening to podcasts while commuting, on lunch break, or while puttering around the house; (yes to all of the above for me) you are in luck. Marginally Podcast is another great one to add to your listening list. If you haven't found them already, head on over to eavesdrop on their great conversations about writing, work, and friendship. 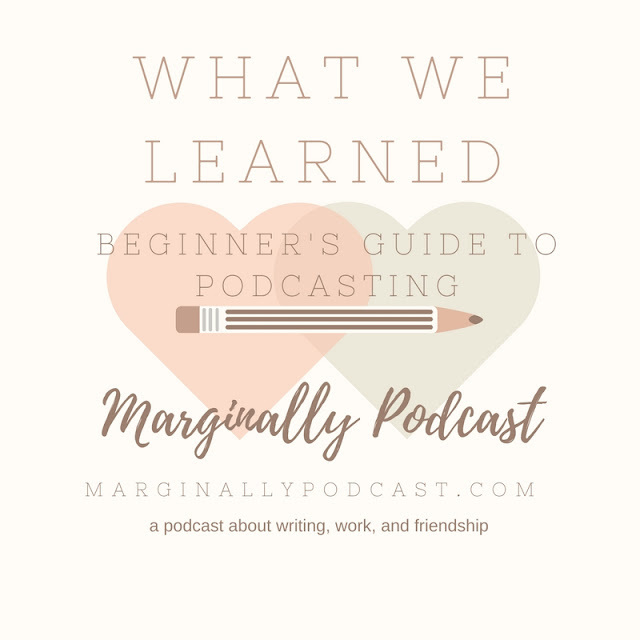 & stay tuned here for their guest post which contains some great advice on what they've learned while podcasting in case you have been considering the journey yourself. We call Marginally a podcast about writing, work and friendship. While we love the writing podcasts that we subscribe and listen to, there wasn’t anything out there speaking to the biggest challenge in our lives -- balancing writing and a day job. That is a reality for most writers, especially when they’re just starting out, and we wanted to change the end-game discussion of quitting it all to write and talk about keeping that day job. So we started Marginally six months ago, and we have had a great time doing it. We’ve become better friends, we’ve become better writers, and we have built a community of people who talk to us about this issue. We hoped the podcast would help us grow and stretch as writers and as friends, and it has -- more than we ever expected. We’ve always found inspiration from knowing we’re not the only ones with our same challenges, and it turns out, we’re not alone in that, either! Talking to others who are learning alongside us has been the most gratifying thing about this project. So today we’re sharing our biggest lessons learned from jumping into something new and exciting without waiting until we were ready – five lessons that are big and philosophical and can be turned into metaphors for writing and life, and three practical ones specifically about podcasting. Putting out a weekly podcast requires some organization, even if you’re not super-obsessive about it. You need to plan what you’re going to talk about, and you need to have a schedule for when you’ll do it. We have an added difficulty of a big time zone gap (between 5 and 11 hours, depending on our guests and where Olivia is each week). The main thing we’ve learned is to commit to this project – and to each other. And we’ve learned that you just keep doing it. Some episodes come out better than others, and that’s okay. Similarly, in many ways, having this podcast has taught us about working on something, getting it as good as you can in the time available, releasing it to the world, and then moving on to the next episode. We don’t have time to be perfectionists about every small detail, even if we’re committed to the quality of sound and discussion. A podcast (just like writing) isn’t meant to be perfect; it’s about connecting with your community and your audience. Because we talk about writing every week, sometimes a few times a week, it has meant that we keep each other motivated to finish our projects, and we check in with each other. It’s a kind of super-supportive writing accountability partner, mixed with a very close friend. We don’t even share our work with each other -- though it’s important to share with someone, it’s easier when we share with other writers, to share with those we have less of an emotional connection with. It’s really worked for us, and it’s kept us more committed to our writing. That said, not every writing partner is equal. This is a great fit for a writing partnership because we are similar enough to understand each other but different enough – and with different enough projects – to not compete. Just because you give yourself permission to fail doesn’t mean you have to do it. In fact, you can change your mindset about your creative projects by making your goal something that you can’t fail at. We didn’t say we wanted to have the #1 podcast in writing, and we don’t measure ourselves by how many listeners or clicks we get. We don’t control those things, not really – and we have enough anxiety in our lives. We just want to put our ideas out, to fill a void we saw in the online writing world, and to find some people who felt the same way that we did. We can’t fail at that, and so we haven’t. - mics – This is probably the most important, as you’d imagine – the microphone in your laptop is usually not good enough quality to record. We both use the Samson Q2U, which is under $100; Olivia once forgot her microphone while on the road so she got the Blue Snowball iCE, and it also had great sound and was cheaper. And lots of people swear by the microphones built-in to smartphones. Whatever you do, test your mic before recording. Every single time. We won’t tell you how many times (and how recently) we’ve realized we didn’t have the right one turned on, or selected, and that leaves you with bad audio or none at all. - Audacity – we edit using this free programme, and there’s no real reason to pay for any other software. You just need some time to google what you’re trying to do (edit out background noise, for example, or change the volume levels), but it’s pretty straightforward. - Canva – we use this free image software to make our quotes for Instagram and other social media. It has paid and free options; we usually use the free ones. - file-sharing -- we don’t live on the same continent, let alone the same city. So we need a place to put all our stuff so we can both work on it. We opted for Dropbox Pro, which has a price tag, because we both already use it for other purposes. If you don’t, Google Drive is another option, and may work better if you’re collaborating more synchronously (because of our time zone gap, we’re usually not working on the same file at the same time). We have a casual podcast, so we do light edits, but don’t go crazy. 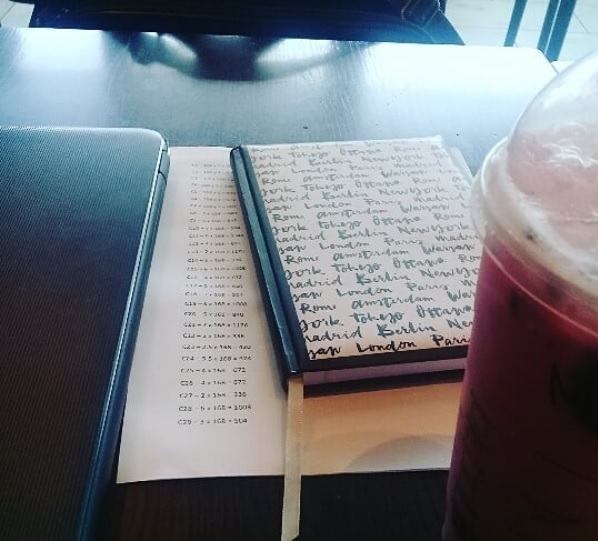 We chose not to script, but instead work from a rough outline. This makes our conversations less smooth, but more serendipitous. We try to edit out the pauses and ums that can interrupt a listener’s enjoyment, as well as background noise, but we don’t need every sentence to be perfect. We also record our own tracks separately and combine them in Audacity, so the quality is the best. There are a billion guides out there to using Audacity, but here’s the one we used ,and it’s about as technical as we get. For us, we had a lot of discussions initially about what we were trying to do. We wrote our four points of our mission statement , but we also talked about practical things: do you want to make money from this, or are you doing this for fun? Do we want to focus on numbers of listeners? How will we know if we are doing a good job? These questions are so important for avoiding misunderstanding if you’re podcasting with someone else, and they’re also critical for determining all your outreach strategies: will you have a blog? How will you use social media? Who’s going to do what? We tend to pick up whatever tasks we have time for each week, but others may want a more formal division of labor. Our biggest worry when we started this podcast was that it would take away from our writing, but it’s turned out to be the best thing we’ve done. It pushes us to experiment, to be honest, and to embrace our creative identities. When we’re less afraid, we’re freer to try. Now if we can just remember to test our mics before recording. 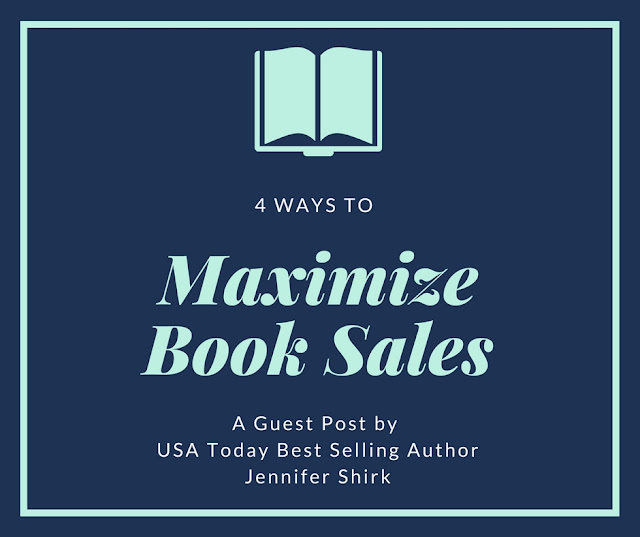 If you've been overwhelmed at the thought of writing, selling, and marketing your book, you will be encouraged to hear from straight-talking, goods-delivering, USA Today bestselling author Jennifer Shirk who has ten books to her name and is on the blog today to tell us her top 4 ways to maximize book sales. 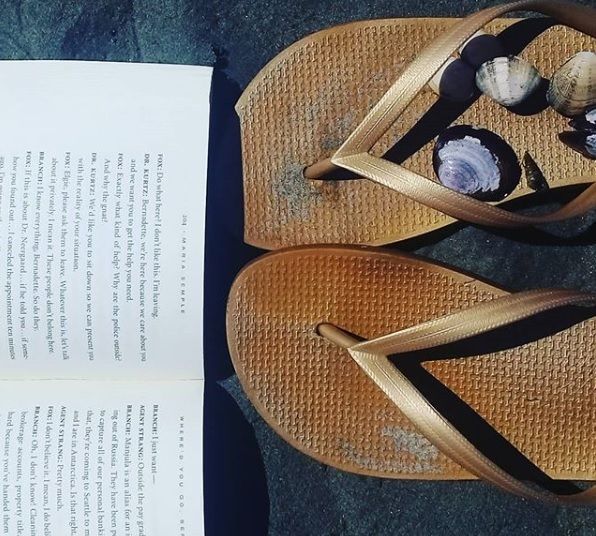 Check out her fun author instagram account if you enjoy a chuckle with your morning coffee. One thing I really believe is that authors are not in competition with each other. The real enemy is TV, Netflix, and movies. And unless you are an author who writes 365 books a year, a reader HAS to read something else while waiting for your next book. So why not collaborate with authors who write in similar genres? Send them an email and ask if they want to do a Facebook party together, or run a contest together, or just recommend each other's books in your newsletters. Chances are you'll both walk away with increased fans. Word of mouth is THE most popular tool in any kind of sales. So ask bloggers who enjoy your genre to host you for an interview or to review your book. The worst that can happen is they say no thank you. Once your book is released, it's a good idea to keep in the public's eye for a few weeks after as well. Remember the Rule of 7. A buyer usually has to see an item or message at least 7 times before they decide to make a purchase. And even if advertising doesn't translate to direct sales then, if/when your book goes on sale in the future, readers will remember your book from the buzz you created and grab it then. Don't be shy. Your subscribers obviously like you and want to hear from you. Ask them to sign up to review ARCs for you or to help promote your new release via social media outlets. You'd be surprised how much your readers really do want to help you. I hope these tips help for your next book release or your next book sale. ABOUT JENNIFER SHIRK: Jennifer Shirk is a USA Today bestselling sweet romance author for Montlake and Entangled Publishing who also happens to be a mom, pharmacist, Red Sox fan, P90x grad, and overall nice person. Don't forget to check out her latest sweet romance, Bargaining with the Boss at an etailer near you. 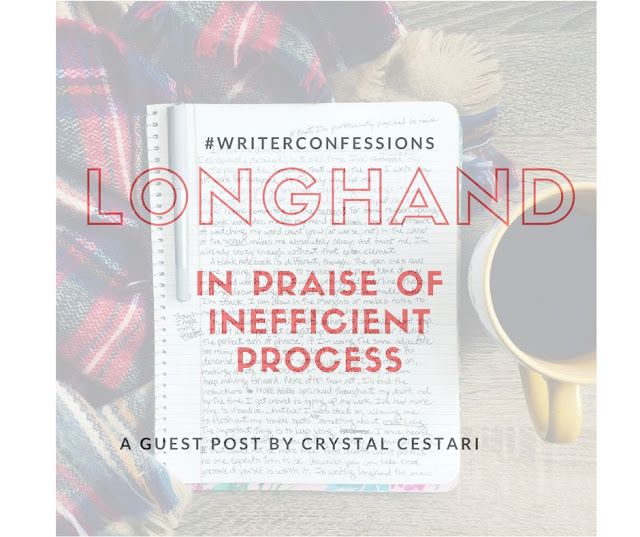 Today's post will resonate with you if you've ever wondered if you were doing it "right" & pursuing your writing in the most efficient way possible. Author Crystal Cestari, whose second book (The Sweetest Kind of Fate coming to you from Hyperion this March) is very forthcoming about her inefficient and successful process and if you visit her colourful instagram account, her love of ice cream, unicorns and all things nerdish as well. I am the World’s Most Inefficient Writer. It’s not a title I consciously pursued, or that I’m particularly psyched to have, but over time, I’ve accepted my fate, knowing that while the way I write may not work for everyone, it’s the only way for me. I write everything longhand. Everything. Whether it’s a blog post of a first draft of a novel, I always put pen to paper before committing to type. For some reason, opening an empty word doc makes my mind go blank, and the constant pressure of watching my word count grow (or worse—not) in the corner of the screen makes me absolutely crazy, and trust me, I’m already crazy enough without that extra element. A blank notebook is different, though. The open lines call to me, giving me a place to scribble and play. None of my misspelled words jump out with jarring red underline; nothing documents the progress I’ve made. Paper has proven to be much gentler than the screen, and the physical act of forming letters is calmer than the clicks and clacks of the keyboard. When I’m stuck, I can draw in the margins or make little notes to myself, planning ahead for future chapters. Does this take forever? Yes. Is it effective? YES. My handwritten drafts adhere to one rule: don’t stop. I don’t let myself get caught up on word choice or finding the perfect turn of phrase. If I’m using the same adjective too many times (which I often do), I go with it, underlining all the examples of the duplicate word so I can find better synonyms later. If I don’t know exactly how to describe a character or setting, I move on, making a note to fix it later so I can keep moving forward. More often than not, I’ll find the instructions “MORE HERE” sprinkled throughout my draft, and it works out, because when I get around to typing up my work, I’ve had more time to visualize what I was stumped by, allowing me to flesh out my trouble spots. Also, my word count usually doubles as I’m typing up what is now draft two because now the entire story is clear; I’ve found my way to the end, and I now understand the beats that need to happen along the way. Terry Pratchett once wrote that “the first draft is just you telling yourself the story” and that resonates with me. First drafts aren’t perfect; they’re messy, just like my handwriting. The important thing is to keep going, and writing longhand helps me do that. Yes, it makes my hand cramp, and sometimes I don’t understand the notes I’ve left myself, but this technique gives me momentum, and that’s what counts. However you can take pressure yourself is worth it, even if you acquire a ridiculous title along the way.